Chicken wings are hugely flavoursome. This citrus marinade works a treat and can also be used for chicken breasts or even pork chops. Place the honey, fruit zest & juice, soy sauce and olive oil into a small bowl and whisk together. 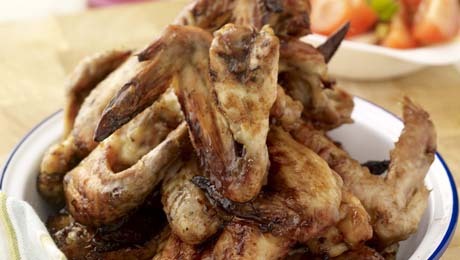 Place the chicken wings into a large roasting dish, lined with baking parchment, and pour the marinade on top. Mix well to ensure they are fully coated. Bake, uncovered, in the preheated oven for 45-50 minutes. Serve immediately with the tomato salad. Place the tomatoes, garlic and spring onions in a large mixing bowl. Add in the olive oil and a little seasoning-mix well and serve immediately. Delicious served with garlic bread.